This summer, I made the impulsive decision to join a corporate softball league, with our company playing seven or eight games against other companies one night a week. And when I went and bought a glove in preparation for the first game, I was appalled at how much they cost, especially considering I couldn't seem to find one small enough or comfortable enough for my hand, that was also in the price range I wanted to pay. So forty dollars poorer, I showed up for our first game on a cool summer night, my black and white tennis shoes getting their first taste of real dirt on the dusty field, since they usually only see the floor of the gym. Since it's been almost twenty years since I've swung a bat - probably the last time was in junior high gym class out on our school football field - I was pretty happy that I at least managed to hit the ball, even if someone always caught it preventing me from getting to base. But when it came to trying to catch the ball out in the field, I fumbled, proved to be completely uncoordinated and earned a great big welt on my leg from that ball that was anything but "soft". At least I didn't catch it against my ankle bone like my coworker did. The next two weeks, we were out of town and I missed a few games, and then, I just didn't go back, deciding I'd get a more worthwhile workout at the gym instead. And now that leather glove sits forgotten in the trunk of my car, along with my "emergency" stuff that never gets used, but that I like having in there, just in case. Not that I think a softball glove will help me if I get a flat tire, but you never know. Although, honestly, I'd rather have my forty dollars back. On a Friday night this month, I had two cakes to bake for a brother/sister joint birthday party the next day. 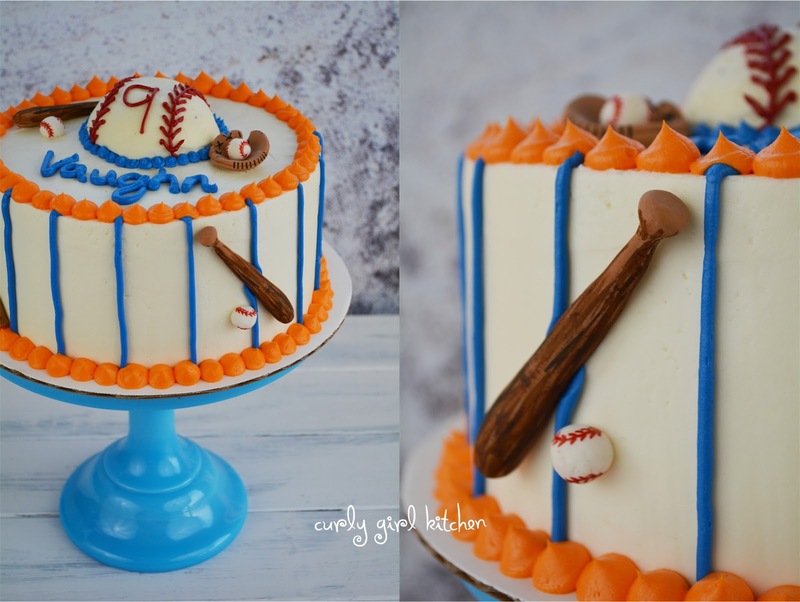 A Rainbow Cake for the girl and this Baseball Cake for the boy. 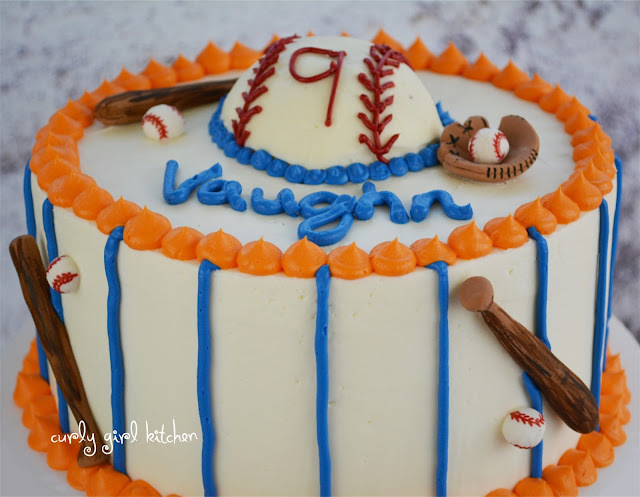 Their mom told me that he is a big fan of the Mets, so that inspired my blue and orange color scheme, with blue stripes around the sides to represent the striped baseball shirts, orange piping, and a softball buried in the center of the cake. 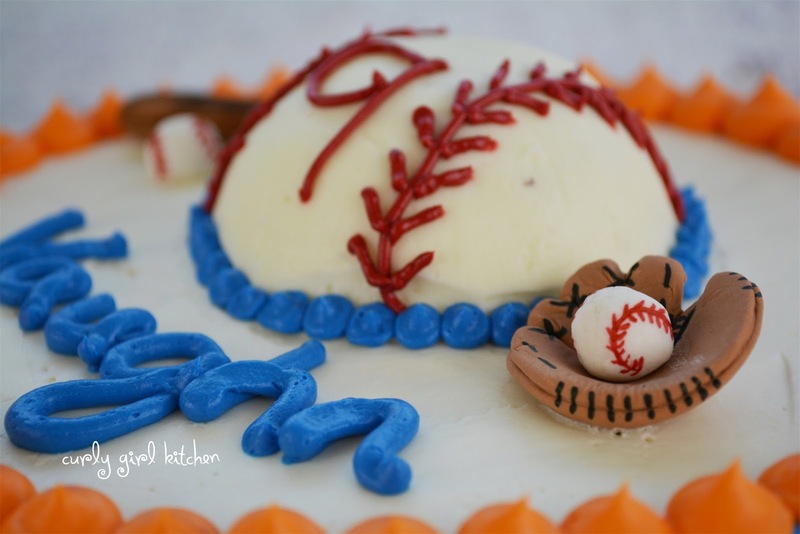 It was the little baseballs, bats and glove that I made out of gum paste that I thought really made the cake, though. 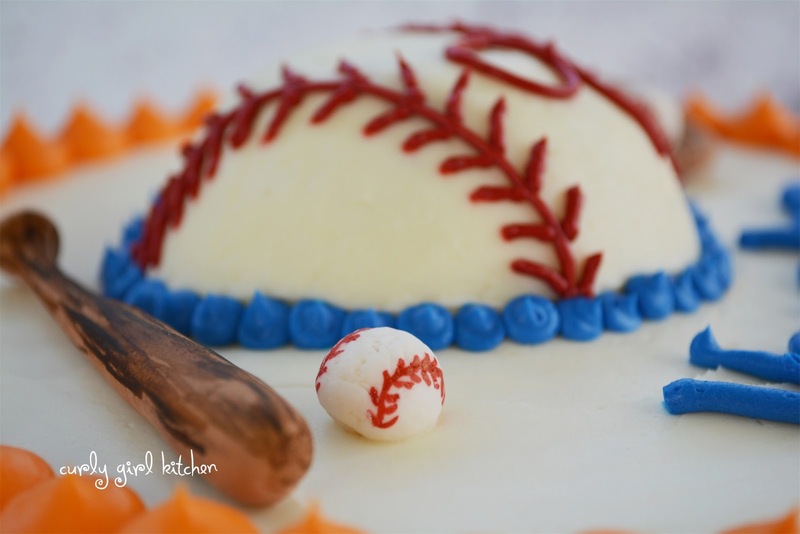 The bats and balls couldn't have been easier to make, with the help of edible markers, and while the glove was a little more difficult, I found a helpful tutorial at Little Delights Cake that gives really clear photo instructions on making a baseball glove out of a simply ball of fondant or gum paste. I remember thinking as a kid that everyone who pitched the ball to me must have been doing a terrible pitching job, because I could only seem to hit a ball if my dad pitched it to me. But, now I suspect that he was pitching it to the exact spot that he knew I'd be able to hit it. So I think the problem may actually have been my batting skills. Softball and me - well, it's just not a match that was meant to be. Make the decorations a few days in advance, so they have time to dry and harden. I used gum paste, but fondant will work equally well. These could also be placed on top of cupcakes. For the bats, roll a small amount of brown gum paste between your hands to form a cylinder, then use your fingers to shape the narrow end of the bat. 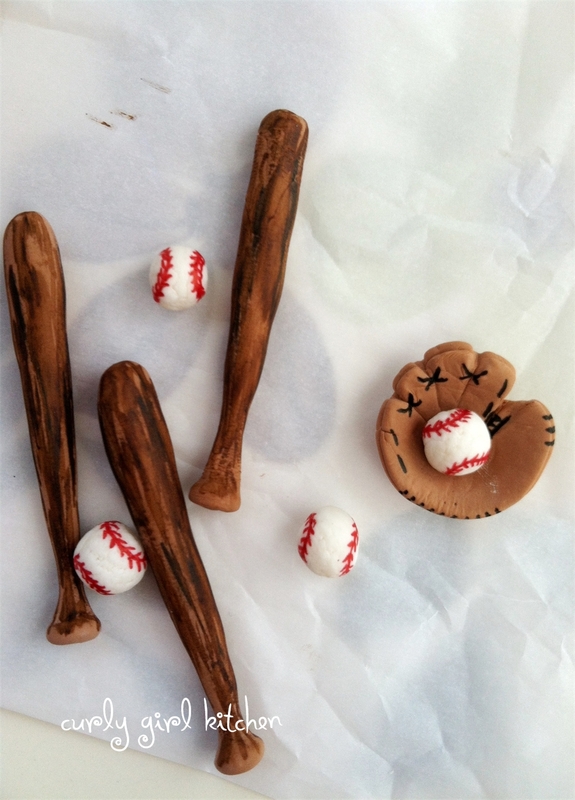 After it dries, use a black edible marker to smudge a few streaks on the bat for the wood grain. For the softballs, roll small amounts of white fondant into balls. Use the red edible marker to draw on the stitching. For the gloves, here are the instructions I used for shaping the glove. While they piped chocolate on for their stitching, though, I just drew the stitching onto mine with a black edible marker. Stack the cakes and frost with a smooth layer of buttercream. To make the cake softball in the middle, I took the extra bit of cake I baked in a small pan and carved it into the shape of a softball, set it on top, and frosted it. 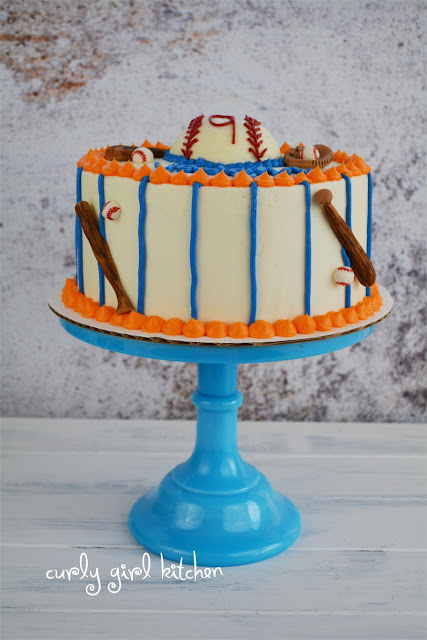 Tint a small amount of the buttercream blue, and use a round tip to pipe the vertical stripes from the base of the cake to the top edge. Pipe a border around the base of the baseball. Tint a small amount of the buttercream orange, and pipe a decorative border around the bottom and top edges of the cake. Tint a small amount of the buttercream red, and pipe the stitching onto the baseball. 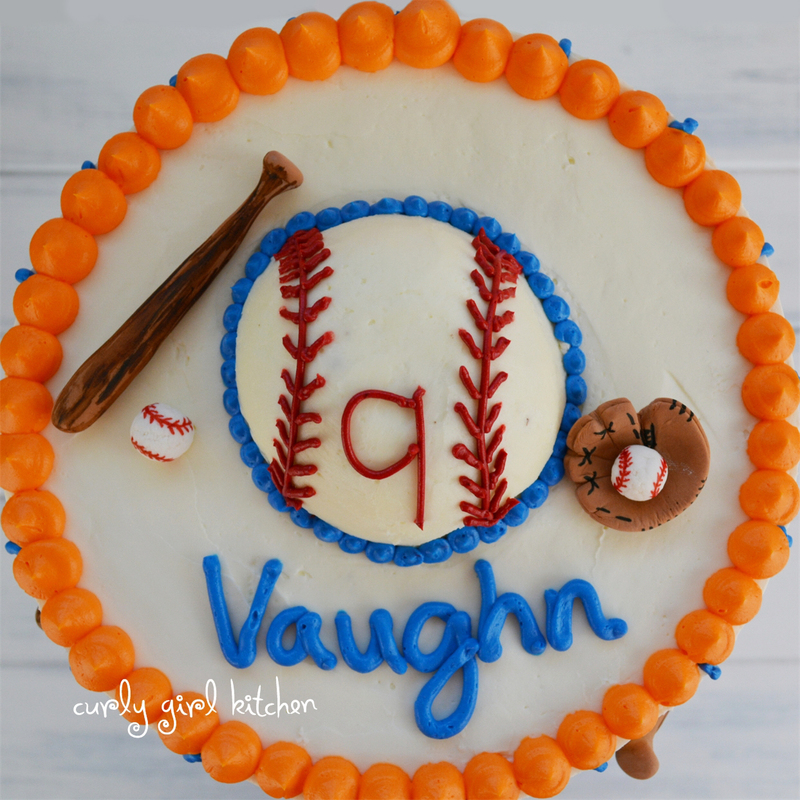 Decorate with your fondant/gum paste creations!